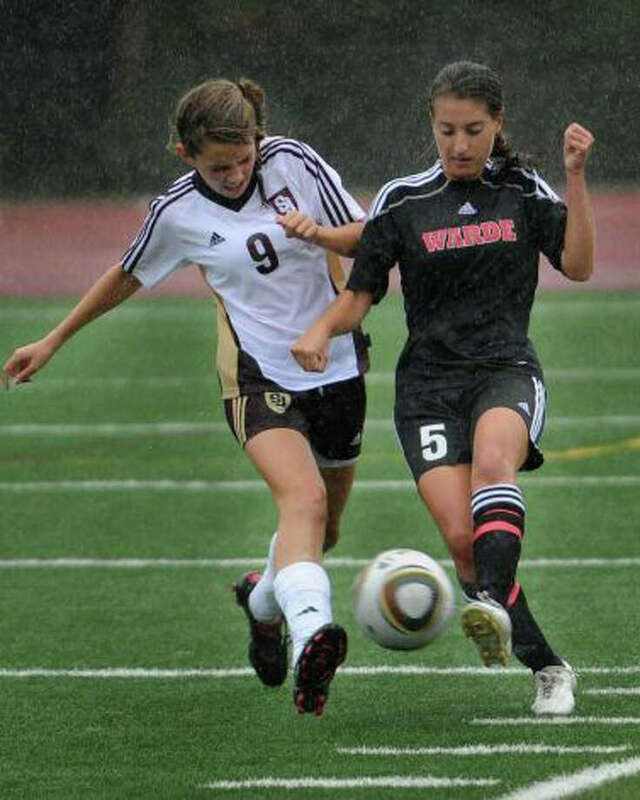 Fairfield Warde's Carly Mappa battles a St. Joseph player during the team's game a year ago. Mappa will return from injury and be a captain for the Mustangs girls soccer team. A year after a shocking loss ended its season, the Fairfield Warde girls soccer team is ready to repeat some more positive recent history. Mustangs coach Tom Cunningham lost just three seniors, all of whom were starters, but his team is experienced and confident that the squad can go a long way. "We have a good solid group returning," Cunningham said. "They know what it is like to win." was all-state and first team All-FCIAC. "We lost a few key players," Cunningham said. "Alex and Taylor were strong parts of our team." The Mustangs lost their final two games of the season a year ago, being ousted by Greenwich in the FCIAC quarterfinals, and then falling in stunning fashion to Farmington in the Class L state tournament. "I think everyone is hungry to get back on the field," Cunningham said. "It was a tough way to go out in the first round of states." Cunningham will get help from Carly Mappa. The senior captain was injured midseason, and missed much of the year. All-FCIAC second-teamer Keegan Thimons is also a captain for the team, leading the midfield. Maggie Allen, Cate Allen, Megan Overby and Casey Taracka all are experienced. Jacob will also start in the back. "We start with a solid defense and that's where our game starts," Cunningham said. "Having those three starters back is a huge piece for us." All-state and All-FCIAC first-team member Emily Pullen is a returns on offense, where she, Mappa, Kristen Tangney and Kristen Santos expect to finish for Warde. Cunningham-- despite moving up to Class LL this year-- has his sights set on the ultimate prize too. Warde won the Class L championship in 2007, and is hoping for a redux in 2011. "We have kids who had siblings who were part of that team in 2007," Cunningham said. "They want to experience that feeling."